When William Langer receives his master of public administration at Saturday's master’s/CAS commencement ceremony, he hopes to set an example for his two young sons and his fellow veterans. As convoy commander, it was Langer’s responsibility to run the missions. “Every time we’d go outside the wire and drive over the roads of Iraq, it was up to me to handle security and make sure the vehicles were prepped,” he said. Langer’s luck held until the vehicle he was in detonated an IED. “That was not the most fun time of my life,” Langer said. The blast tore all the muscles in his back and caused traumatic brain injury; he was awarded the Purple Heart. When he was deployed to Iraq a third time, he decided to earn his associate’s degree by taking online courses offered by the University of Maryland. “I’d work 36 hours followed by eight hours off,” said Langer, “and I’d spend half that time studying. Anytime I was waiting for a convoy, I’d have my nose in a book.” He received his degree in a ceremony that was held in what had once been Saddam Hussein’s palace. After his discharge in December 2010, Langer returned to Buffalo. “It was a culture shock, just trying to remember how to live like a civilian,” he said. He was also suffering from posttraumatic stress disorder (PTSD). Langer came to Buffalo State where he served as acting president of the Student Veterans of America while earning his bachelor’s degree in communication studies with a straight-A average. 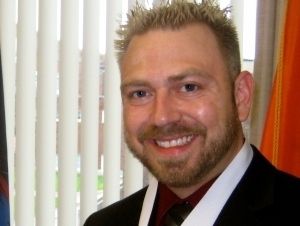 After taking a position with the federal government, Langer returned to Buffalo State and has earned a master’s in public administration, again earning a perfect average.